October 10, 2015–The following news compilation is posted today on the New Cold War.org website. Also on the website recently are articles reporting on the changing situation in the Middle East following Russia’s military intervention on the side of the governing regime of Bashar al-Assad in Syria. One of those articles is ‘Russia’s intervention in Syria, by Eric Margolis, Oct 4, 2015. This was the fourth deadly bomb attack in recent months in Turkey targeting antiwar and Kurdish political forces. 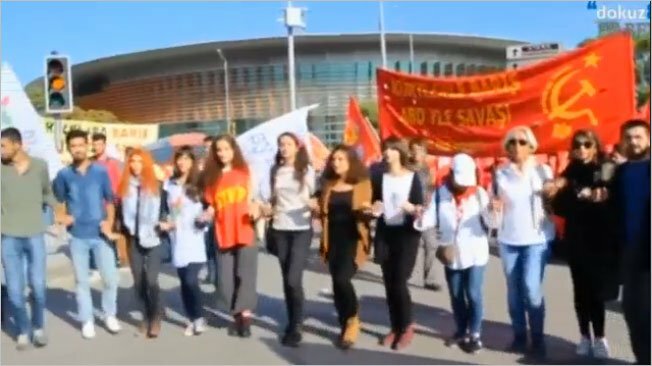 The Oct 10 antiwar rally in Ankara was organized by the country’s public sector workers’ trade union and other civic society groups, calling for an end to the renewed military conflict between Kurdish rebels and Turkish security forces. At least 86 people were killed when two suspected suicide bombers hit a rally of pro-Kurdish and leftist activists outside Ankara’s main train station on Saturday, weeks ahead of a national parliamentary election to take place on November 1. It was the deadliest attack of its kind on Turkish soil. Bodies covered by flags and banners, including those of the pro-Kurdish opposition Peoples’ Democratic Party (HDP), lay scattered on the road among bloodstains and body parts. “Like other terror attacks, the one at the Ankara train station targets our unity, togetherness, brotherhood and future,” President Tayyip Erdogan said in a statement, calling for “solidarity and determination”. Health Minister Mehmet Muezzinoglu told a news conference that 86 people had been killed and 186 wounded, 28 of whom were in intensive care. The death toll could rise further. Witnesses said the two explosions happened seconds apart shortly after 10 a.m. as hundreds gathered for a planned march to protest over a conflict between Turkish security forces and Kurdish militants of the PKK party in the southeast. The attacks, in the scale of casualties, exceeded events in 2003, when two synagogues, the Istanbul HSBC Bank headquarters and the British consulate were hit with a total loss of 62 lives. Authorities said those attacks bore the hallmarks of al Qaeda. Saturday’s attacks came as expectation mounted that PKK militants would announce a unilateral ceasefire, effectively restoring a truce that collapsed in July. 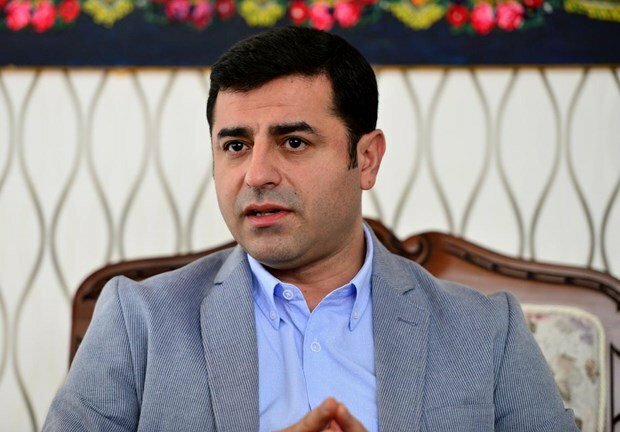 The government had already dismissed the anticipated move as an election gambit to bolster the HDP, whose success at June elections had helped erode the ruling AK party’s majority. Hours after the bombing, the PKK ordered its fighters to halt operations in Turkey unless they faced attack. It said through the Firat news website it would avoid acts that could hinder a “fair and just election” on Nov. 1. 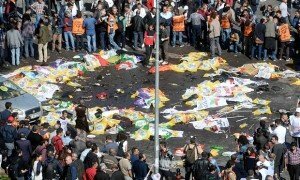 Footage screened by broadcaster CNN Turk showed a line of young men and women holding hands and dancing, and then flinching as a large explosion flashed behind them, where people had gathered carrying HDP and leftist party banners. “We are faced with a very big massacre, a vicious, barbarous attack,” HDP leader Selahattin Demirtas told reporters. The Interior Minister said he could not confirm it was a suicide bombing. Some activists saw the hand of the state in all three attacks on Kurdish interests, accusing Erdogan and the AK Party of seeking to stir up nationalist sentiment, a charge Turkey’s leaders have vehemently rejected. “Suruc, Diyarbakir and now Ankara, all works of murderer Erdogan. We will tear down that palace,” said a 21-year-old university student, Tarik, who had been less than 50 meters from one of Saturday’s blasts. Pockets of activists still at the scene chanted “Murderer Erdogan” and “the murderer AKP will give account”. Authorities were investigating claims Saturday’s attacks were carried out by suicide bombers, two government officials told Reuters. Prime Minister Ahmet Davutoglu canceled his next three days of election campaigning and held an emergency meeting with the heads of police and intelligence agencies. Renewed conflict in the southeast since July’s collapse of the two-year-old ceasefire, had raised questions over how Turkey can hold a free and fair election in violence-hit areas but the government has so far said the vote will go ahead. Turkey’s problems have been compounded over the last week by Russia’s launching of air strikes in neighboring Syria that could further swell a refugee population of over two million on Turkish soil. Turkey has protested to Moscow over incursions into its air space by Russian warplanes. Those involved in Saturday’s march tended the wounded lying on the ground, as hundreds of stunned people wandered around the streets. Some rushed to hospitals, where crowds gathered to donate blood. Bodies lay in two circles around 20 meters apart where the explosions appeared to have taken place. “This brutal terrorist attack on peaceful demonstrators is also an assault on the democratic process in Turkey which I vehemently condemn,” German Foreign Minister Frank-Walter Steinmeier said. The attacks come three weeks ahead of an election at which the AKP is trying to claw back its majority, and at a time of multiple security threats, not only in the southeast but also from Islamic State militants in neighboring Syria and home-grown leftist militants. Designated a terrorist group by Turkey, the United States and the European Union, the PKK launched a separatist insurgency in 1984 in which more than 40,000 people have been killed. It has since reduced its demands to greater rights for the Kurdish minority; but Ankara fears a link-up between Kurdish militants in Turkey and Kurdish groups in Iraq and Syria that could lead to demands for a separate Kurdish state. The state launched peace talks with the PKK’s jailed leader Abdullah Ocalan in 2012 and the latest in a series of ceasefires had been holding until the violence flared again in July. * Bombing of political rally in Diyarbakır, Turkey, Wikipedia: “The 2015 Diyarbakır Rally bombings occurred on 5 June 2015 in Diyarbakır, Turkey during an electoral rally of the Peoples’ Democratic Party (HDP) at 17:55 local time. The bombing took place two days before the June 2015 general election and killed 4 supporters, injuring over 100.